In 1998, Chris Zaino was living a dream. He had won Mr. America, had a BS degree, was on magazine covers, was a personal trainer for Universal Studios Florida and was married to his wife, Whitney. Life was good. Despite his successes, Chris’ health was going downhill fast. He developed a digestive disorder, going to the bathroom 10-15 times a day, bleeding. He tried to keep it a secret until after lost his bowels in public one day, in a department store, he finally had to tell his wife what was happening. Diagnosed with an incurable, terminal, autoimmune disease, Chris went from 230 lbs to 158 lbs in just 4 months. His only option with hope was to have his entire colon removed, followed by a regimen of expensive prescription drugs for the rest of his life. Just before surgery, he ran into his high school anatomy teacher, who invited him to meet his wellness doctor, learning from him how the body heals. In only 7 months time, his body had healed itself from a diagnosed, incurable, terminal disease. Chris went on to get his Doctorate in Chiropractic medicine, starting his own wellness clinic in 2005, going on to become the largest clinic in history, seeing over 2,800 patients per week. By comparison, an average office sees around 100! Even with all his success and accomplishments, including his beautiful wife and sons, winning Mr. Universe in 2016, becoming an IFBB pro competitor and helping thousands of people, he was struggling – depressed and burned out. Something was missing. He realized that the qualities he wanted for himself – to be admired and achieve great things – had become lost. In looking it up, the qualities he was looking for in himself were finally defined – a HERO. He had taken on a Secret Identity, based on what he did for a living, not who he was destined to be. Chris embraced his Hero and created his 4-step “Hero Rises” Methodology: 1) Embracing the Hero mindset 2) Maximize your Super Powers 3) Choose your vehicle of Influence 4) Monetize your message for the survival of your Legacy. 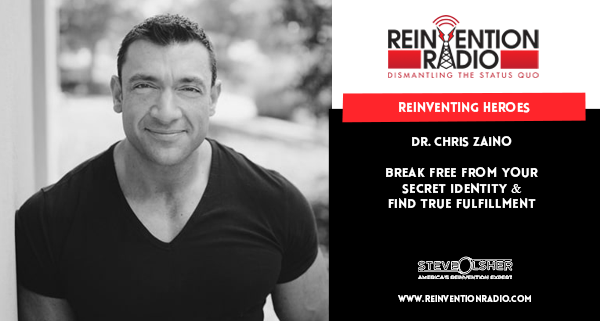 Tune in to hear Dr. Zaino chat with Steve, Mary, and Richard about breaking free from your secret identity and finding true fulfillment. Reinventing Weight Loss – In this episode, tune in to hear Adam Schaeuble chat with Steve, Mary, and Richard about letting go of weight gain guilt, setting goals and sticking to them.